I am about to embark on an adventure. Thanks to thoughtful planning and uncommon generosity on the part of my youngest child, I will soon fly to Thailand by way of Tokyo and then home by way of Seoul three weeks later. Each way I’ll be in transit for over 24 hours, and I will cover nearly 9,000 miles. I’ve never been to Asia before, but I have been on an air trip that took nearly that long, and I realized as I awoke this morning that I feel something like the same sense of awkward anticipation, nervous tension and absolute thrill of adventure I felt in that long-ago moment, as I was about to embark on that first trek. It was 1957, and I was a miserable child, more than generous with my pain. My mother hoped that spending the summer away from home might make me lose some weight and gain an appreciation for my parents. Since my half-sister, who lived in Los Alamos, was expecting her fourth child — her oldest was just 4 — and since I was already a skilled mother’s helper, being the first of (so far) five, Mom decided that the perfect solution for everyone’s ills was for me to travel to New Mexico and spend the summer there. You don’t think about it nowadays. Flying cross-country is so matter-of-fact and takes so little time. 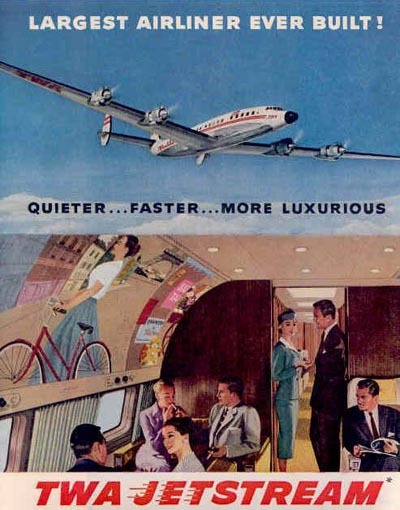 But I am talking about an era when air travel was still a novelty, and my sister’s home seemed like a very long way away from mine. We had driven there a few times in my life, and I remembered the long days in the car, the endless sky and cloud formations, the bottomless font of hymns my father could sing to keep us from going absolutely stir crazy. It took five days to get there . And now they were telling me I would reach my destination in only one! My mother bought me a brand new, pink dress from JC Penney, a matching pink sweater, pink socks and white patent-leather shoes and for my flight. I felt downright regal when I tried it all on, though my bright red glasses kept sliding down my nose. We drove to my grandmother’s in Queens, an 8-hour journey that was rendered delicious by my father’s recent discovery that the best way to travel by car with children was to do so at night, so we dreamed soundly all the way in the moving vehicle and arrived in the morning, giving me plenty of time and vigor with which to engage with my cousins, who were veteran flyers, having been already to Europe. They filled me with stories about the terrible things that could happen, and I felt a growing dread that only made my excitement more thrilling. Since they lived in Bayside, LaGuardia was near by. 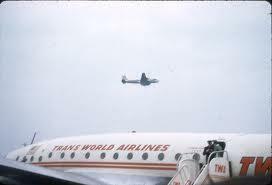 The airline of choice — we didn’t have a lot of them — was TWA, whose hub was there. We parked right by the airfield and went into a small waiting room, which was on ground level and had a wall of window that looked out onto the landing field. When the plane was ready to board, the stewardess — sorry, that’s what we called them then — came into the room and took me by the hand. “Are you ready to fly with me?” She fairly sang, as I put my gloved hand into hers. My mother took a photograph of me walking out to the airplane, and I remember seeing it years later, long after I’d made transatlantic flights and become something of a seasoned flyer. The plane looked so small, so fragile, and I looked so relieved to be climbing aboard; I do remember feeling like I had to duck to avoid hitting my head on the wing as we approached. I also remember my heart was thumping, and I was wondering what I would possibly do with myself for 21 hours while we flew. I had two books to read and stationery on which to write my thoughts for reporting back to Mommy, but 21 hours just seemed such a long time to just sit. I needn’t have worried. The flight crew was aware of me, and they entertained me lavishly. There was the obligatory visit to the cockpit, I got to “help” with the food and beverage, which meant that I served the boxed lunches to each passenger, and I visited the lav pretty frequently. At one point, like a scene out of Volunteers, one of the Stewards pulled out a guitar and began to sing folk songs to the section of the aircraft where I was seated; in those days, passengers sat facing one another like they might on a train today. 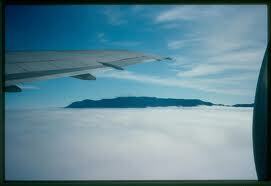 Besides, the flying time was not all that protracted. We stopped in Chicago, Kansas, St. Louis, Oklahoma City and Amarillo, sitting on the ground long enough to refuel, load in more box lunches and board new passengers, before we got to Albuquerque. I was sleepy but unable to sleep, and when we reached Amarillo, I thought I heard the pilot tell us we were in Albuquerque, so I deplaned. For a terrible few minutes, I was horrified to see no familiar faces in the assembled greeters at the runway. Expecting, at very least, the tall, looming presence of my sister’s husband, I was dissolved to tears when no one in sight looked remotely related. But before I could lose myself in despair, my guardian angel stewardess had grabbed my shoulders and was steering me back on board. We landed in Albuquerque a very short time later, and all the family members were there to meet me. It was an elegant beginning to a glorious summer. My sister, resplendent with the empathy of young motherhood and free of the burden of shaping my womanhood, encouraged me to play. So I did, cavorting gleefully with my niece and nephews. She sent me to a summer program where, as happens in a summer camp setting, I made brief but brilliant friendships. I ate ice cream without remorse, and I did lose some weight. I read, I wrote, I even watched some television. And when I returned home, I was no longer miserable. I felt soothed, renewed. What a lovely memory to find as I prepare for my Journey to the East. No misery to lose, no pounds to shed, I am ready, simply, to be filled with the wonder of it all. Have a great trip Carla! 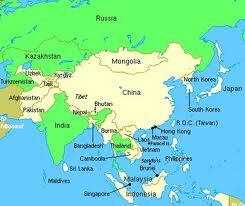 Thailand is high on my list of places we want to visit. Take lots of pictures! love the story. what a great juxtaposition. The childhood Carla and the present-day Carla, still filled with wonder and adventure. Have a blast!! !